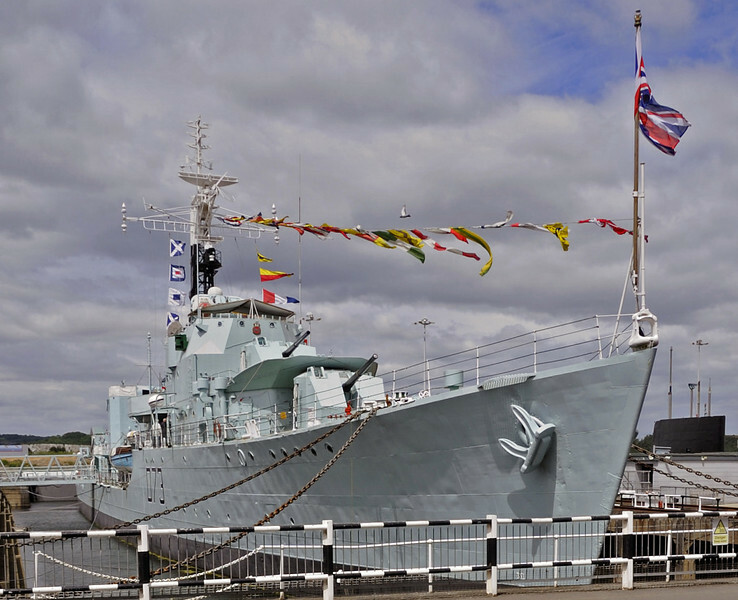 19 photos of the 1944 destroyer HMS Cavalier, the only Royal Navy destroyer to survive. HMS Cavalier, Chatham dockyard, Sat 9 June 2012 1. Cavalier was built by White's of Cowes and commissioned in 1944. After war service in the Arctic and East Indies one of her four 4.5in guns was replaced by two Squid anti-submarine mortars; later a Seacat anti-aircraft missile launcher was fitted. She paid off for the last time in 1972, a year after reaching 31.8 knots and narrowly winning a race with the frigate Rapid. There followed a difficult career in preservation but in 1999 she came to Chatham where she is hopefully secure as she is the only Royal Navy destroyer to survive. British built destroyers survive in Canada (HMCS Haida) and Poland (Blyskawica).